The Customizr WordPress theme (since Customizr free v3.4.19 & Customizr Pro v1.2.19) uses Font Awesome icons. Earlier versions used three sets of icon fonts : Genericons, Entypo and Glyphicons. Font Awesome includes much more icons (605+ as of today), especially for the social networks. This set of icons is also frequently updated with new icons. Font Awesome icons are vectors, which mean they’re gorgeous on high-resolution displays, like Retina Displays. The version of Font Awesome used in the Customizr themes is 4.5+. 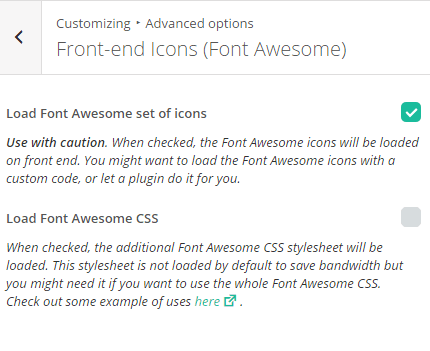 Font Awesome 4.5.0 doesn’t support IE7, but an older version does. You’ll need to check out the 3.2.1 instructions for using IE7. You can use them just like a normal font and use CSS properties like color, size, gradients, … Perfect for beautiful and light weight web design.